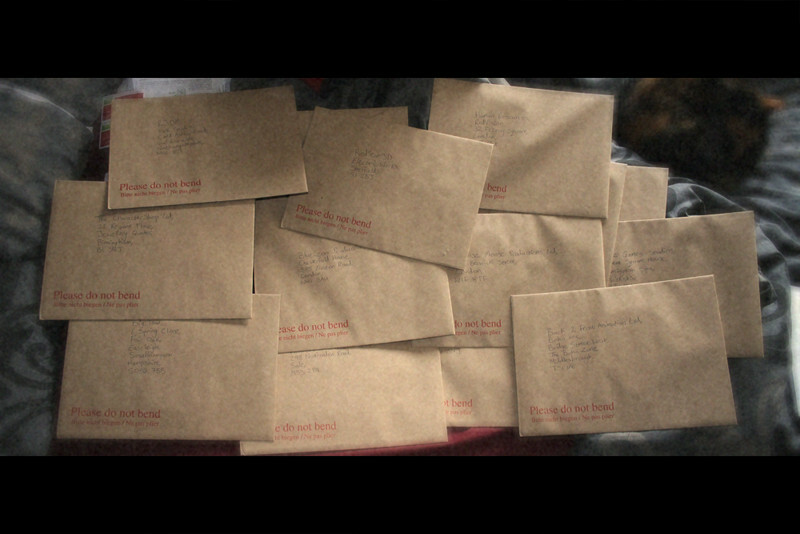 Today I sent away 15 packages consisting of my CV and showreel to different companies in the UK. It took quite a while getting everything together to do this for some reason. Lots of redoing CVs and I changed my showreel at the last minute so I had to burn all the DVDs again. I sent off some applications to four different animation festivals too. Two are in the UK and two are abroad so hopefully OverCharged will get in to one of them. I'm hoping that all this will pay off somehow. Animation job pleeeeeeeeeeeeeeeeeeeeeeeease!!!!! Oh yeah, I'm not sure why I spent a few minutes messing about in Photoshop trying to make a picture of the packages look like a still from a film. Must be all the storms around Wales affecting me. Oh my!